Now that the weather is warmer, now is the perfect time to be outside and being outside means we can do some grilling as mentioned in my previous post regarding some bbq pork spareribs. Instead of your typical grilling of, say, steaks, burgers, or pork spareribs, I decided to go with something a little more exotic with a Korean flair. I decided to grill up some Korean-style barbecued beef short ribs which is more commonly known as kalbi and sometimes referred to as Hawaiian short ribs (you can order these at any L&L Hawaiian Barbecue restaurant). On Bobby Flay's show, Grill It! (not to be confused with Bobby Flay's other bbq shows like BBQ Addiction and Boy Meets Grill), on the Food Network he has a guest named Judiaann Woo (episode: Short Ribs). She shows Bobby Flay (the one and only Boy Wonder at the grill) and us how to make kalbi. Kalbi, kimchi (pickled cabbage), and bibimbop (a rice dish mixed with meat and various vegetables) are probably my favorite Korean dishes. You can see from the video below that kalbi is not that difficult to make. It's very easy to prepare and easy to grill up, and everyone seems to enjoy these ribs every time I make them. 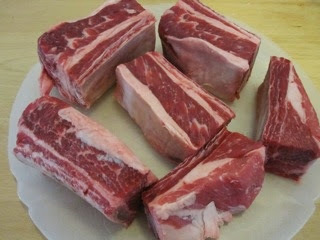 Flanken Cut Beef Short Ribs purchased from the Asian Market. To make kalbi it is absolutely crucial that you have the right cut of beef. You can't get just your normal run of the mill beef short ribs. You have to get beef chuck flanken-style ribs (also called LA ribs) which contain the rib bones and are cut lengthwise such that you get a cross section of several ribs in each slice as opposed to the English cut where it is sliced between each bone which is what we're more accustomed to. Each slice is about a quarter to a half inch thick and about 8 to 10 inches in length, and they are usually prepared by braising or cooking in liquid. You can usually find this cut of meat in a Korean or Asian market like Ranch 99 (sometimes my local Safeway would actually have it); otherwise, you can probably ask your local butcher to cut it in this fashion. The recipe provided has pretty much all the ingredients that you would expect from a marinade for kalbi: brown sugar, soy sauce, etc. I did add a few more ingredients after I consulted my friend who makes kalbi all the time and who is Korean, so making these ribs are in her blood. What she does is that she adds sesame seeds to the marinade. Not only that, but she toasts the sesame seeds on a skillet and crushes them in a mortar and pestle. Toasting the sesame seeds and crushing them in a mortar and pestle releases more of the natural flavor and aroma of the seeds. What I like to do is to toast additional sesame seeds to set aside and garnish the short ribs along with the green onions once the ribs are done and ready for plating. Toasted sesame seeds for garnishing your kalbi. Note the darker color of the toasted sesame seeds. My friend also recommends using a kiwi if you don't happen to have an Asian pear. The reason why she uses a kiwi (or Asian pear) in this recipe is not only that it adds a certain level of sweetness, but it also acts as a tenderizer to soften up the meat. Definitely mash up the kiwi to form a paste or use a food processor to puree it when incorporating it into the marinade. Short ribs in itself is an inexpensive piece of meat, but making kalbi is very forgiving in that you can grill it up and it won't be tough after marinating for several hours. Also, when chopping the onion for the marinade, definitely chop the onion finely (or run it through the food processor as well). I find that the smaller the onion pieces, the more flavor is imparted into the meat. Because these short ribs are quite thin, it doesn't take long for them to fully cook so be sure to not overcook them, yet you also don't want them to be rare. Even though they can get overdone quickly, these short ribs are, as mentioned earlier, rather forgiving. Sometimes you like to get a nice carmelized char on the surface or the corners because the burnt edges of the meat give you an added flavor which you can easily attain when grilling over an open flame. I first tried this recipe in our stove top grill, but I would imagine it would be just as good if you did this on an outdoor grill (your standard Weber kettle grill or gas grill would do just fine). I actually like eating my kalbi with some siracha or gochujang on the side as a condiment to give it a little bit of kick (Sriracha would work too). Because these ribs are very easy to prepare and cook, it's an ideal dish to bring for picnics, camping, and even tailgating at football games. Marinating your kalbi for a few hours. I like to add toasted and crushed (in a mortar and pestle) sesame seeds to the marinade. Save some uncrushed toasted sesame seeds to go along with the green onions as garnish. I like to use a kiwi if I don't have an Asian pear available. The kiwi or pear adds a little bit of sweetness to what is otherwise a savory dish. 1. Toast sesame seeds on a skillet until golden in color and fragrant. Crush 2 tablespoons of the sesame seeds in a mortar and pestle and set aside. 2. Sprinkle brown sugar over beef and mix well to evenly coat. Let sit at room temperature for 10 minutes while preparing marinade. In a bowl, whisk together remaining ingredients [including the crushed sesame seeds]. Transfer beef into a large sealable freezer bag or container. Add marinade, press out excess air from bags, and seal. Turn bag over several times to ensure beef is evenly coated. Refrigerate for at least 4 hours but preferably overnight. 3. Heat gas or charcoal grill to medium-hot. Drain excess marinade off beef. Grill short ribs, turning once, to desired doneness, about 3 to 4 minutes per side. Garnish with thinly sliced green onions [and the teaspoon of toasted sesame seeds], if desired. Serve whole pieces as a main course or cut into smaller pieces, using kitchen shears, for a starter or party nibble.